For the second time this summer, another name has been added to the exclusive list of Triple Crown winners. 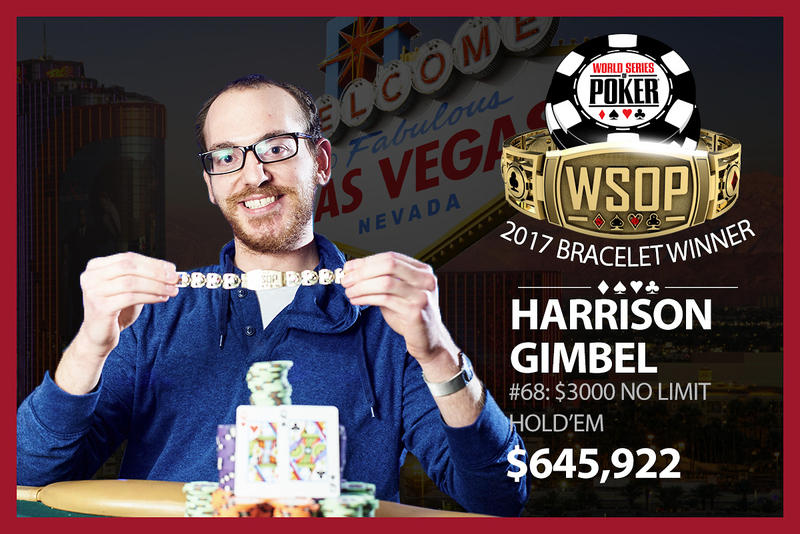 This time, the feat was accomplished by 26-year-old poker pro Harrison Gimbel. The Jupiter, Florida native topped a field of 1,349 entrants in the $3,000 no-limit hold’em event at the 2017 World Series of Poker to snag his first career gold bracelet, as well as the $645,922 first-place prize. As a result, Gimbel now has all three pieces of poker’s Triple Crown. To earn a Triple Crown, a player has to win a World Poker Tour main event, a WSOP bracelet, and an EPT or PokerStars Championship main event. The first player to win the Triple Crown was Gavin Griffin in 2008. He was followed by Roland De Wolfe, Jake Cody, Betrand Grospellier and Davidi Kitai. A little less than two weeks ago, Mohsin Charania became the sixth player to earn the honor. Although Gimbel scored a big payday, it wasn’t even the largest score of his summer, let alone career. In late May, Gimbel chopped the PokerStars Spring Championship of Online Poker (SCOOP) main event with Charlie Carrel, banking $1,122,873. Gimbel’s EPT victory came in 2010, when he won $2.2 million in the PokerStars Caribbean Adventure main event. His WPT title was won in 2016 at the WPT Rolling Thunder for $275,112. Gimbel now has $4.6 million in live tournament earnings, along with another $2.8 million won online. Chance Kornuth finished runner-up, narrowly missing out on his second bracelet. Other notables to make the money included Ryan Van Sanford (3rd), Matt Salsberg (13th), Eric Froehlich (16th), Kevin Saul (28th), Daniel Negreanu (29th), Ryan Laplante (32nd), Joe Elpayaa (34th), Tony Dunst (41st) and Ryan D’Angelo (43rd).